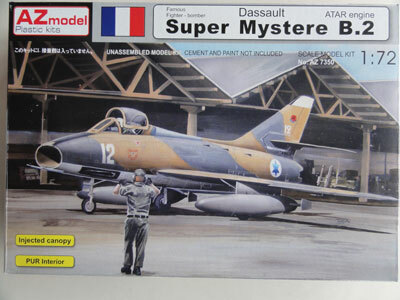 Another second Airfix Super Mystere 1/72 kit was made as described on page 1. 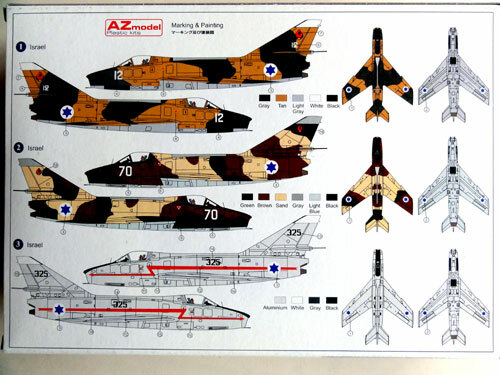 I had spare decals from an AZ Model kit that will be described below for an Israeli Air Force (IAF) aircraft in a desert camouflage scheme. 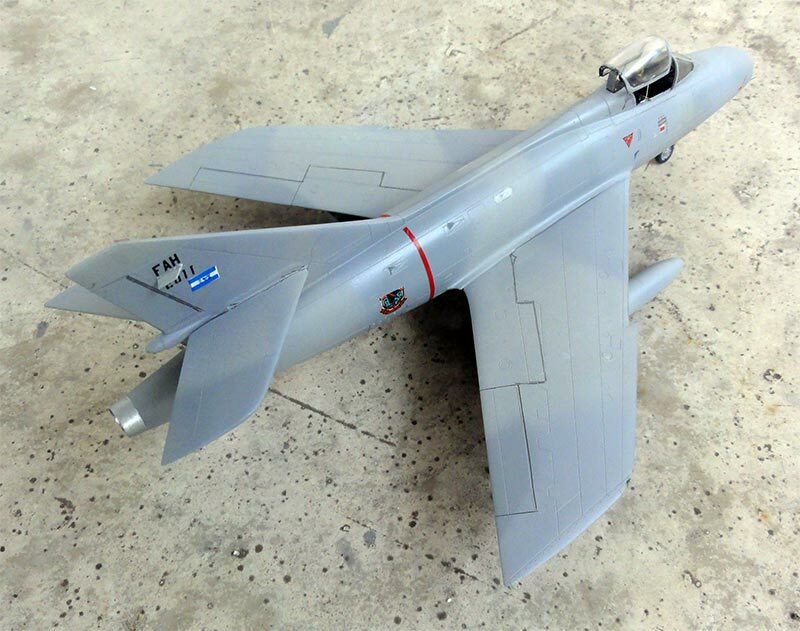 I recommend also looking at an excellent article that was published in "Scale Aircraft Modelling" magazine of January 2019 about the Israeli Super Mysteres. 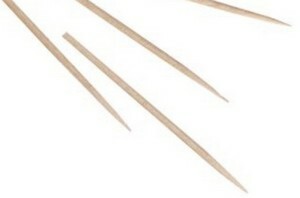 The Airfix kit was again made almost straight out of the box. Inside the air intake I made a sort of tunnel from card that looks better when viewing the model from the front. Also in the cockpit some details were added such as side consoles from card. The canopy will be set closed so I used the kit seat but added the release straps on top and harnesses. 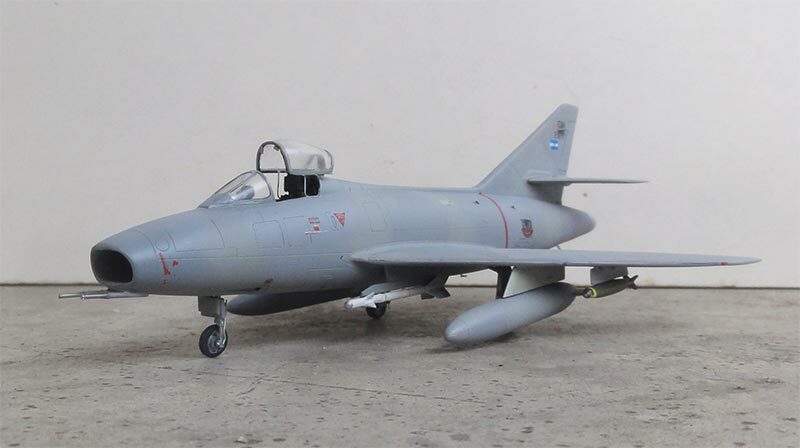 The Israeli Super Mysteres had first the Hispano license made Martin Baker mk.6 ejection seat and later even A-4 Skyhawk ESCAPAC seats were used in the type. The raised panel lines of the kit were kept and preserved. 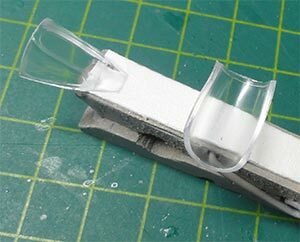 The edges of the ailerons were sawed in with a razor saw. The lower two gun ports were drilled open. The model needed quite some putty/ filler and when sanded got a base grey coat to check for any small surface errors. I also drilled out the various holes in the two air brakes that were to be installed in the deployed position. 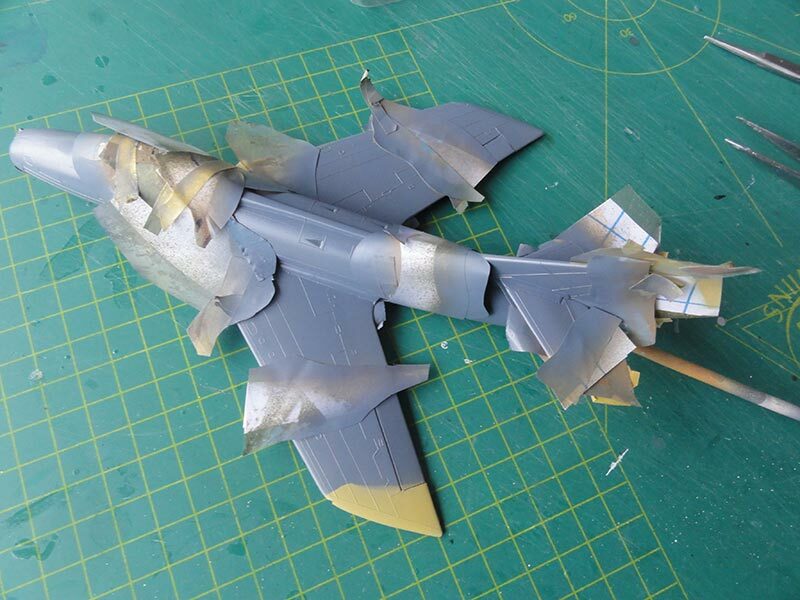 The camouflage scheme was airbrushed as described in the AZ model kit for aircraft coded "12". 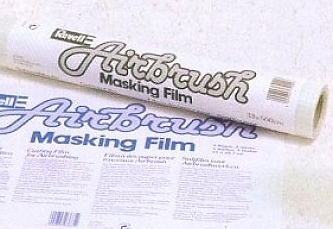 The colour demarcations are "hard" so masking film e.g. from Revell and tape were used. 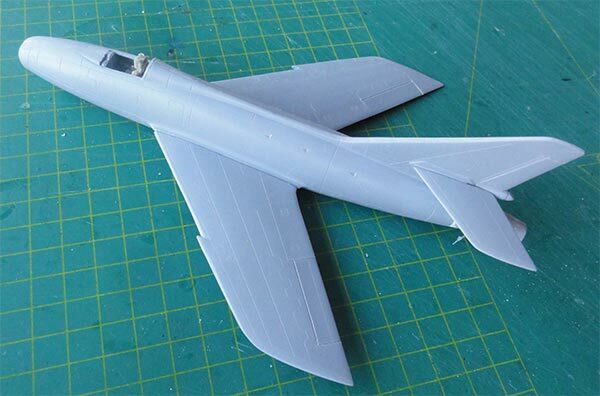 First the lower surfaces were airbrushed in a light grey coat of Revell aqua 371. (Some Super Mysteres also had "Sky" lower finishes here but not the picked scheme here). 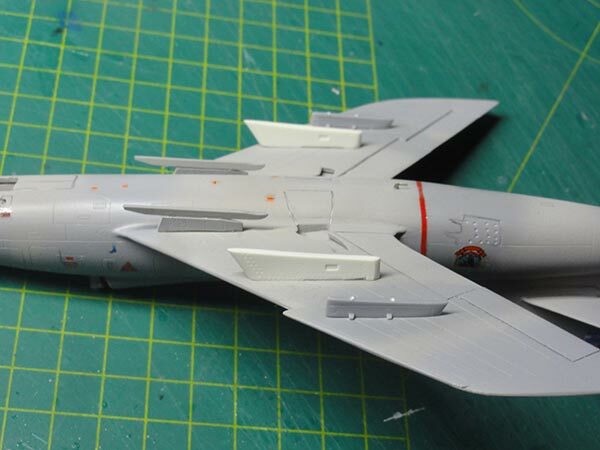 The lower surfaces were masked and next was a top coat of "sand" using Revell aqua 16. Next followed the pattern of blue-grey (approx. 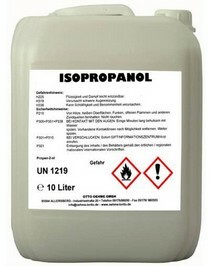 RAL 5008) using Gunze Sangyo H56 acrylic which seemed to be a good match. Please note that interpretation of these colours is not easy as these IAF aircraft were operated in various desert conditions but these paints seemed appropriate. 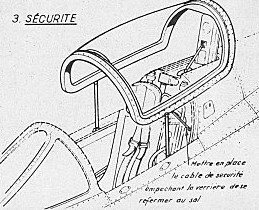 The gun blast area below the cockpit was masked and airbrushed black. The main landing gear bay doors were set closed as usual on parked aircraft. 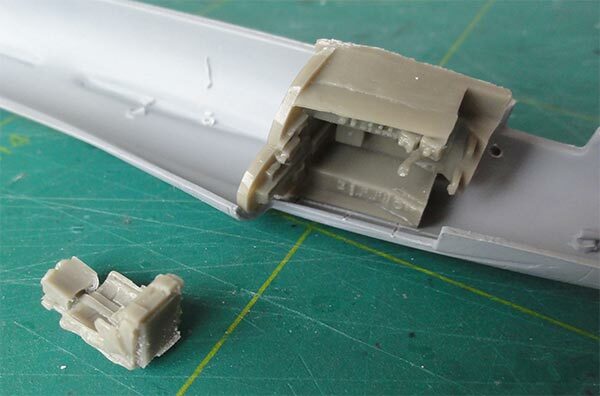 The bays and insides of doors were painted dull aluminium as well as the gear legs. The exhaust was painted burned metal. The canopy frames were hand painted in the camouflage colours and any small paint errors corrected by scraping of any surplus paint with a wooden cocktail stick. The canopy was set closed, I had to scrape of a bit the inside edges to fit it and the small gaps filled with white glue. 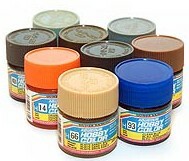 When dried, these were painted in the surrounding camo colours. 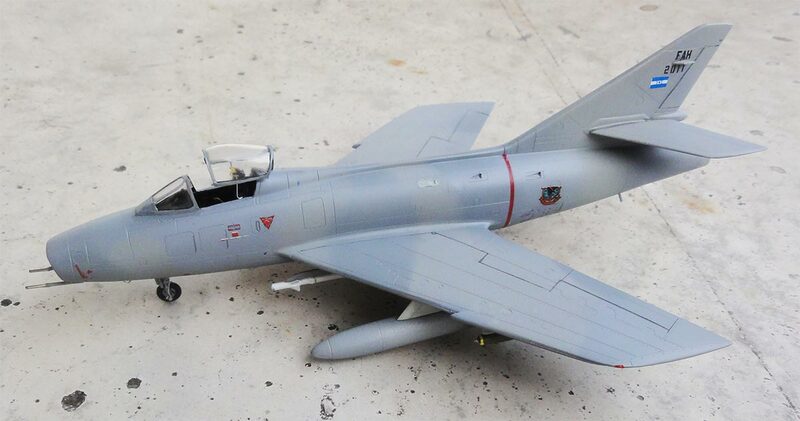 The model got the IAF decals for aircraft coded "12" from the AZ Model (described below). 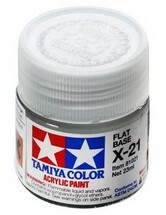 The paints surfaces were glossy so it was not needed for just a few decal to a airbrush first a gloss varnish coat. 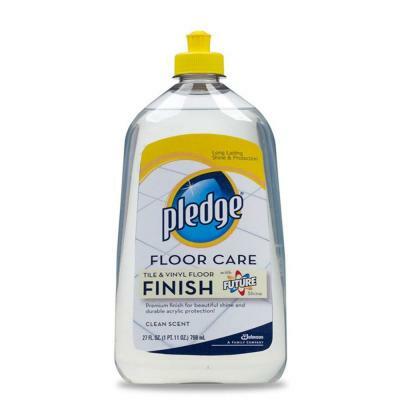 Each decal was "dragged" through some drops of Johnson Future/ Pledge floor varnish to adhere better. 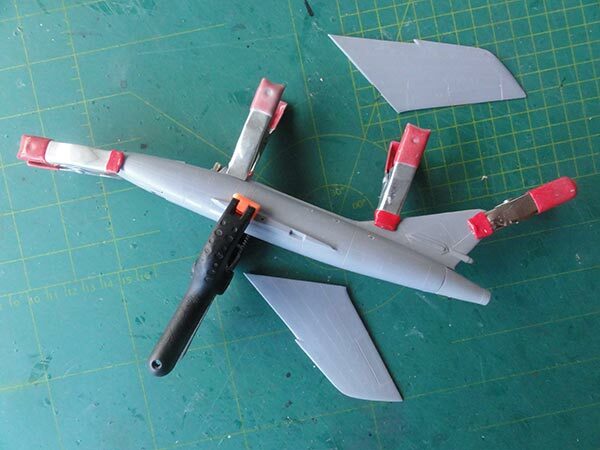 After that, the landing gears and smaller bits were set in place. The nose pitots were also set as well as a small fuel dump pipe at the lower fuselage. 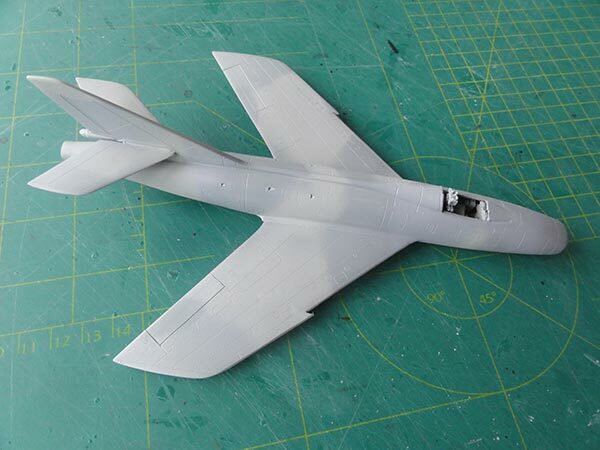 I used the wing fuel tanks from the Airfix kit and these were airbrushed in a dull metal aluminium colour. The air brakes were set deployed open. The red walkway lines were made of red thin Fantasy print shop decals. 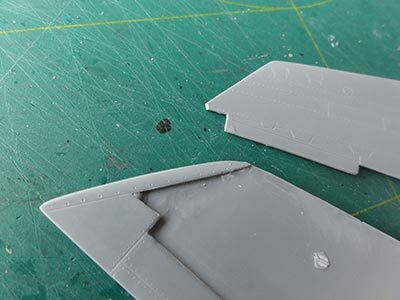 The wing tip anti-collision lights were suggested by cutting out a notch with the X-acto knife, filling it with Micro Kristal Kleer and painting these red (port/ left tip) and green (starboard/right tip). The final coat to get an even sheen and protect the decals was airbrushed: a mat coat with the usual technique through a mix of Johnson Future/ Pledge and 10% Tamiya X-21 Flat Base matting agent and 25% IPA alcohol mixed in. 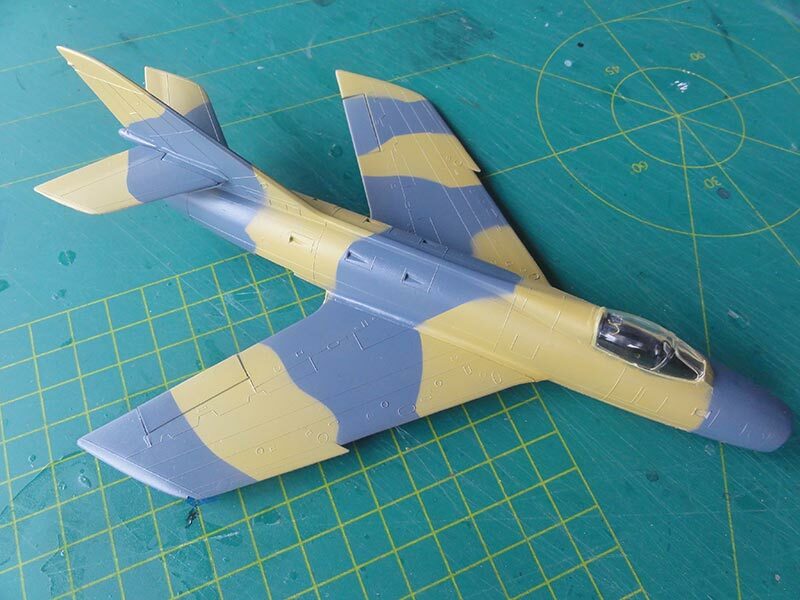 That completed another nice Super Mystere B.2 in 1/72 scale. 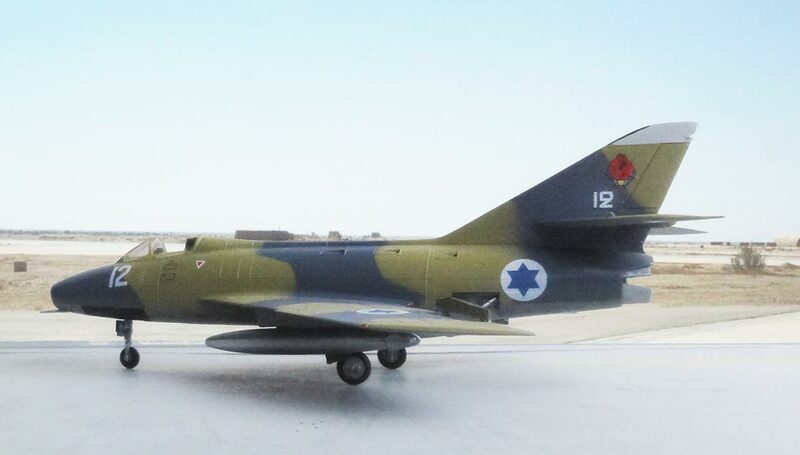 The Israeli Air Force ""Hel Ha-Avir" had in the 1950s previously operated Dassault Mystere jets and acquired first some 24 Dassault Super Mystere B.2 aircraft from December 1958. The Super Mysteres were fitted with Atar engines with afterburner and was the first supersonic IAF jet. hey went to fly with the "scorpion squadron" in the interceptor role. In 1960 aerial engagements with Egyptian and Syrian MiGs were a fact. The Super Mysteres proved to be ineffective as interceptor and better suited for multi-role ground support. Meanwhile in 1962 Mirage IIIC fighters arrived to fulfill the IAF interceptor role. Most of these Super Mysteres were bare metal or had a camouflage scheme. Several Super Mysteres were lost and so some 12 additional aircraft were acquired and later before the Six Day War of June 1967 additional 9 extra Super Mysteres "leased" from Dassault. Many Super Mysteres got another camouflage scheme with sand FS33531, tan and green FS34227 and lower surfaces with duck egg blue FS35622. (In 1968 France set an arms embargo regarding to the Israel armed forces. It was proposed by IAF engineers do a major modernization conversion on many Super Mysteres B.2 in service and this resulted in the Sa'ar or "storm". Later on some 16 of these Israeli Sa'ar aircraft were sold to Honduras in 1975 that called it the "Sambad", see notes below regarding the AZ Model). IAF Super Mystere B2, coded "12" of the "scorpion squadron"
The third Super Mystere B.2 model is from AZ Model which released several of these kits #7347 / 7350 / 7351 with different decals. 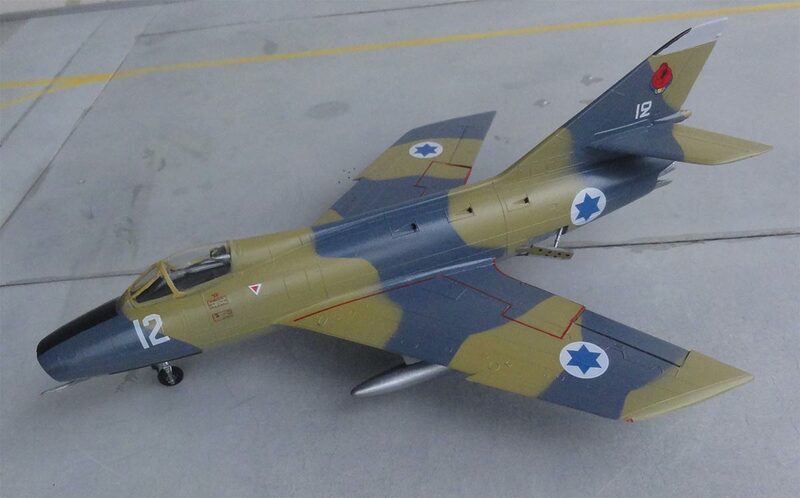 I had kit #7350 that has markings for Israeli air force aircraft with 2 camouflaged and one bare metal schemes. 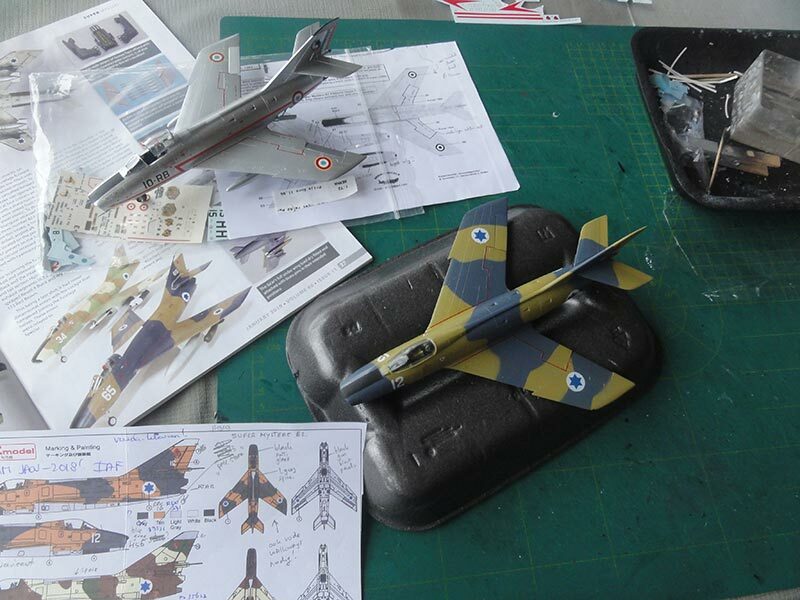 The decals look good (and a set was used on the IAF model seen above). 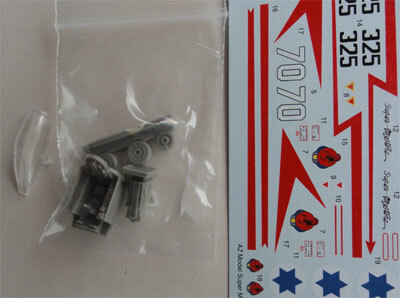 The kit is of the short run type with some 35 parts and the model shape looks accurate. You get plastic parts and some resin parts for the wheels, seat and cockpit tub. 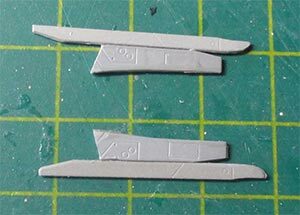 This kit release also has the parts #23 for the longer tail pipe in the sprues (but is not needed for the schemes provided). 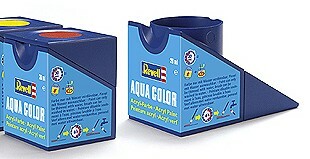 The cockpit tub is one piece of resin. The seat is a separate part. 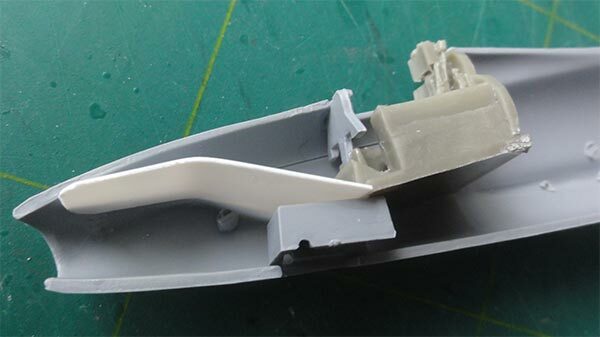 The 2x3 small intake slots/ vents on the mid-fuselage are moulded closed. 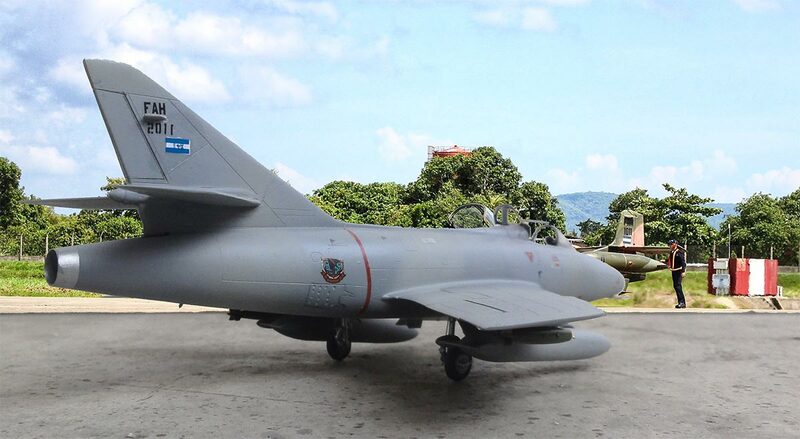 I opted to make the later version called Sa'ar ("storm") in the IAF and of which some 16 aircraft were delivered to Honduras. That would be nice in the "World Air Forces in Plastic" collection. 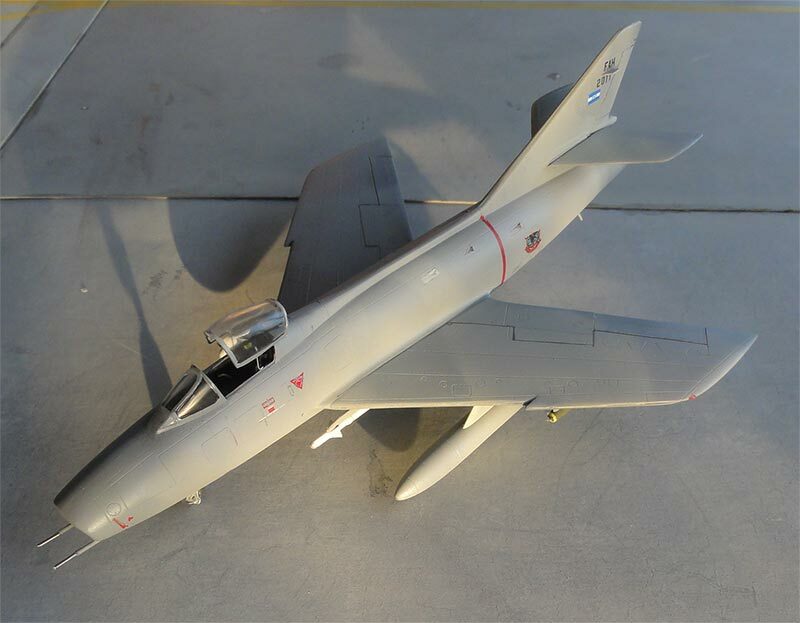 As noted above, the Israeli Air Force operated the Dassault Super Mystere B.2 aircraft from December 1958. In 1968 France set an arms embargo related to the Israel armed forces. 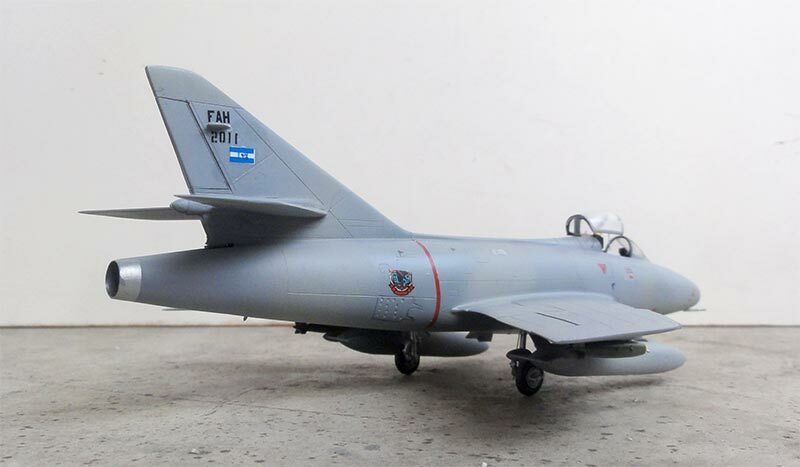 It was proposed by IAF engineers to re-engine the Super Mysteres B.2 with the Pratt and Whitney J52-P-8 engine as these were also used in the IAF A-4 Skyhawks. The lighter J52 engine meant that the fuselage' inside had to be slightly adapted. The weight reductions also meant that more weapons could be carried and the engine also had a lower fuel burn. Also new systems were installed and 2x3 pylons fitted for armament. 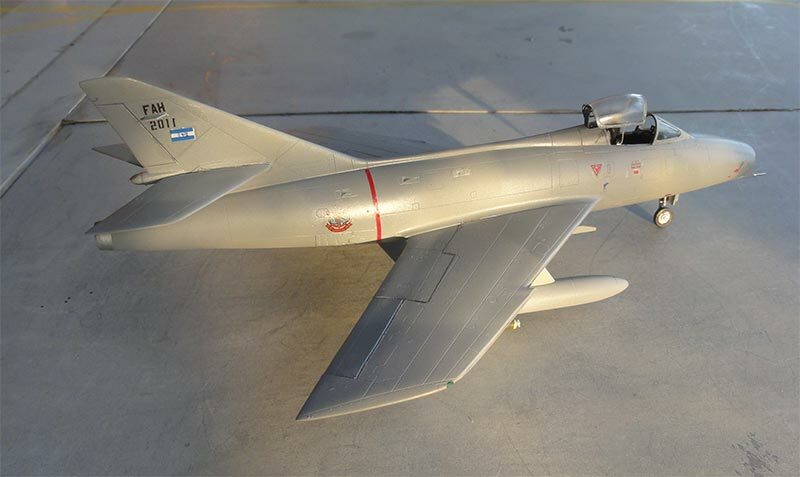 The improved Super Mystere was called the Sa'ar ("storm") and the first aircraft was ready end 1969. On the inboard pylons also Shafrir 2 IR AAM missiles could be carried. 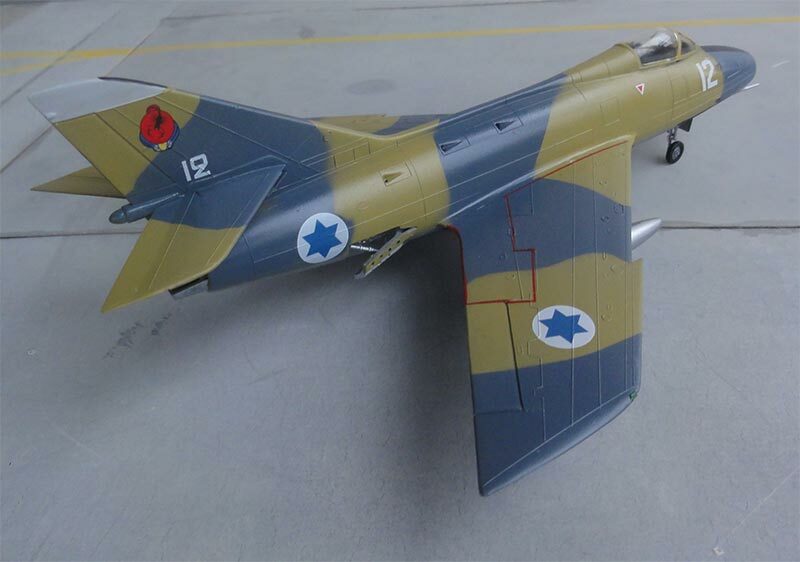 Some 24 Sa'ar aircraft were converted and probably from 1971 it was decided to fit a 1 meter longer tail pipe deleting the convergent/divergent nozzle. This was to counter heat seaking enemy missiles (in fact also many A-4 Skyhawks got a longer jet exhaust pipe). Some 16 of these Israeli Sa'ar aircraft were sold to Honduras in 1975 that called it the "Sambad". 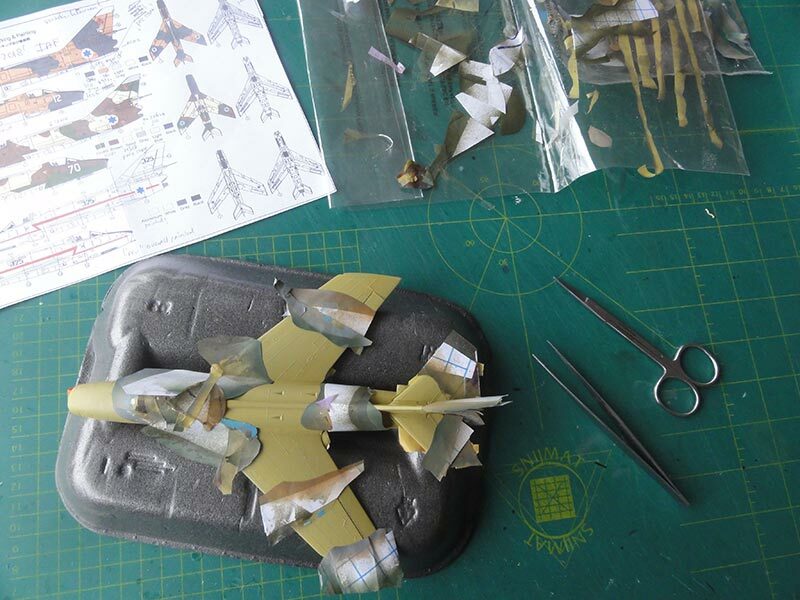 In the AZ model kit the longer tail pipe parts #23 are included as fitted on the Sa'ar. But there are just 2 small pylons and no stores at all. In the kit there is also no air intake duct though the intake is open. 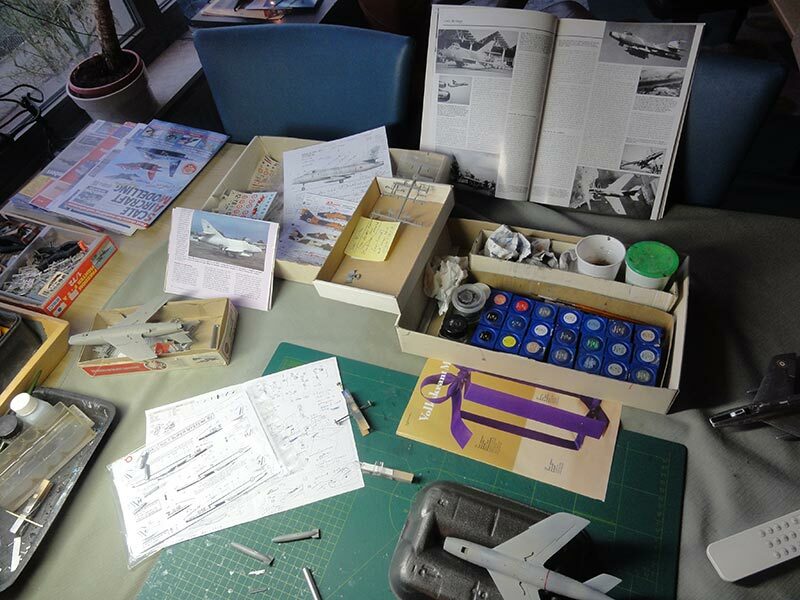 The basic assembly of the AZ kit starts with the fuselage. With some plastic card I suggested an intake duct. 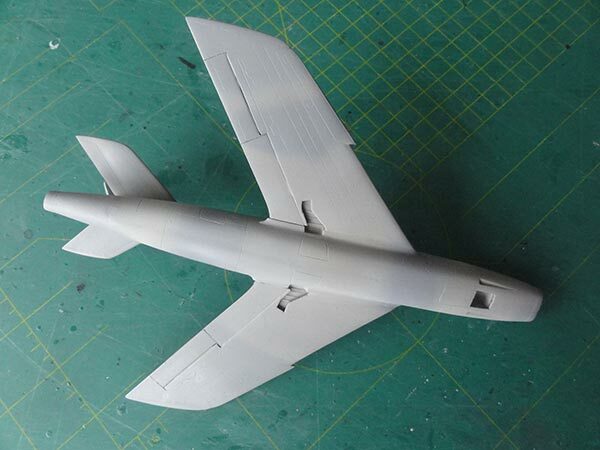 One outside half of the long tail pipe was first glued to one fuselage halve to get good alignment. Let dry and later one install the other half. The wing roots need putty as well. 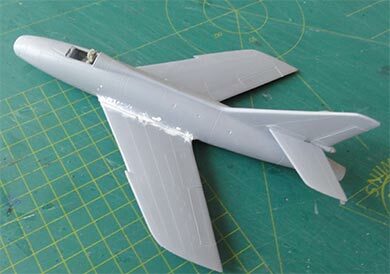 The pair of air brakes on the rear lower fuselage are inscribed in the kit but their holes are missing. 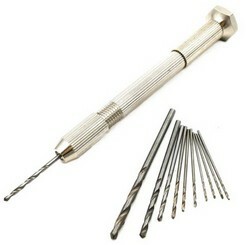 Four rows with holes were suggested onto the brakes by drilling with a pin vise. 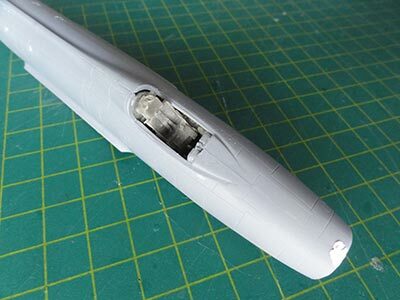 I also drilled open the gun ports in the lower nose. 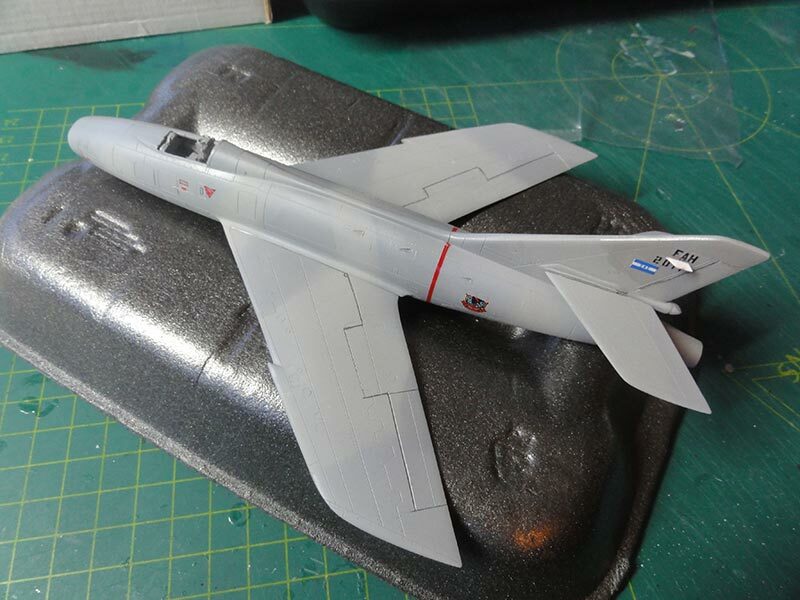 The model now got a coat of light grey by airbrushing Revell aqua 75 steingrau to check for any filling errors and irregularities. 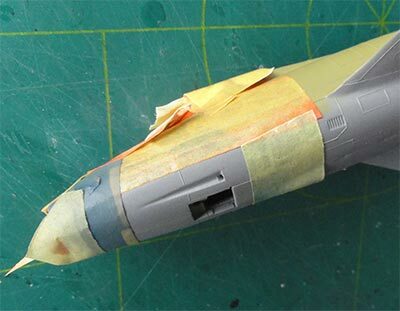 Some tiny filler corrections were made such as at the longer tail pipe. The gear bays, insides of doors and landing gear were handpainted aluminium. There are only a few markings seen on the Honduras jets. 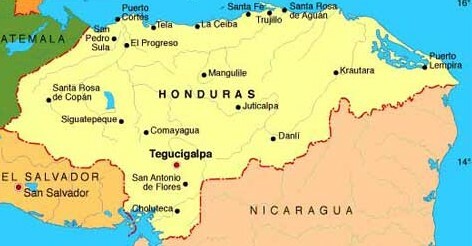 The Hondurian flag was made from a Guatamala flag from an AZTEC A-37 set 72007 with 5 very tiny blue dots added suggesting the "stars". The FAH letters and aircraft number were also found on that set. I also saw a photo with a sort of unit marking aft of the red turbine warning stripe. I found 2 decals that resembled these good enough at this scale in the spare decal box. I also wanted to fit the model with "stores". It was quite difficult to find good pylons and stores. I had no other options so with some vague photos were used for making these from scrap. I made 2 small inboard pylons for the Shafrir II missiles that look to be shorter Sidewinder. I used the missile rails #19 from the kit. 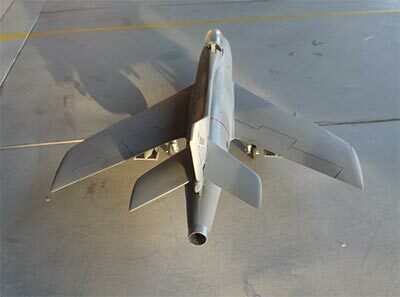 A Shafrir II missile was made from an old AIM-9B Sidewinder found in the spares box that was reduced in length. 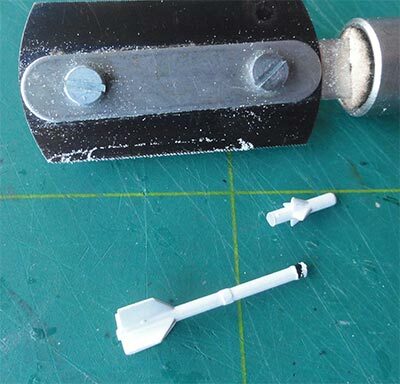 The real missile is 2,5 meters in length so made to be 35 mm in 1/72. 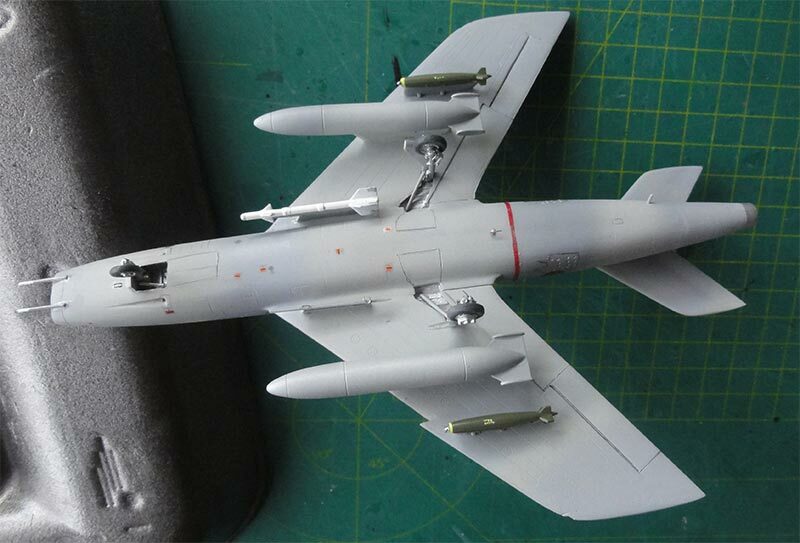 The missile vanes and fins were painted light grey. For the outboard pylons I found a few ones in the spares box that only needed some shaping through anding. Stores could include bombs or Zuni rocket pods with TERs. 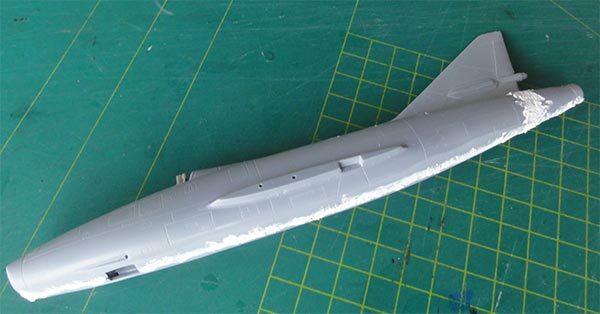 The large 1,300 liter fuel tanks are not provided in the AZ model kit and the tanks supplied in the Airfix Super Mystere kit are the smaller type. 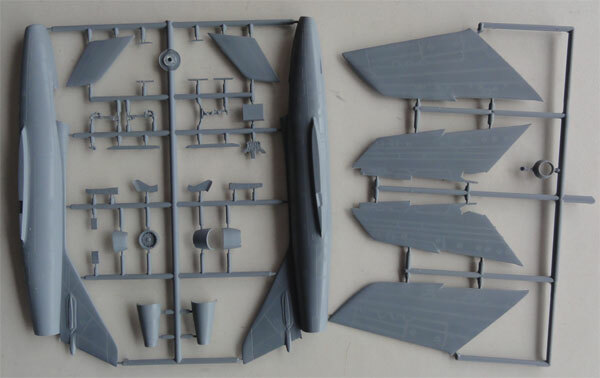 I sourced the larger 1,300 liter tanks from 2 Academy Super Etendard models and their large pylons were made from scrap. The smaller bits and landing gears were now installed. 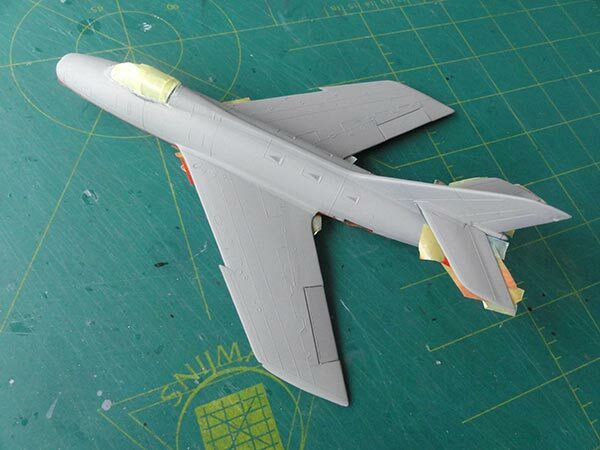 On the vertical tail 2 blade antennas were installed as seen on the Sa'ar made from card. Below the nose the 2 pitot tubes were installed and a small fuel dump pipe below the tail. The flaps and elevator edges got a wash of tinned black paint. The 2 large fuel tanks and pylons were set in place. The made Shafrir II missile was set in place as well as two mk.81 250.lb bombs from a Hasegawa weapons set I (X72-1). The now separated windscreen was scraped a bit on the inside at its lower edges to fit better. All was blended in with white glue and all was painted in the surrounding camouflage when dried. The model got the usual semi-dull coat of Johnson Future with 10% Tamiya Flat Base X-21 and 25% IPA alcohol mixed in with the airbrush. The canopy and windscreen is one piece in this AZ kit. With a razor saw the rear canopy was separated. 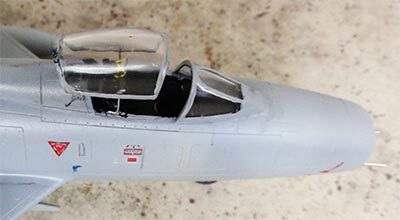 The canopy raises on the real aircraft horizontally upwards and the structure to set it open was made from some plastic rod. The canopy got some detailling with 2 tiny mirrors made from thick aluminium foil and set in place. 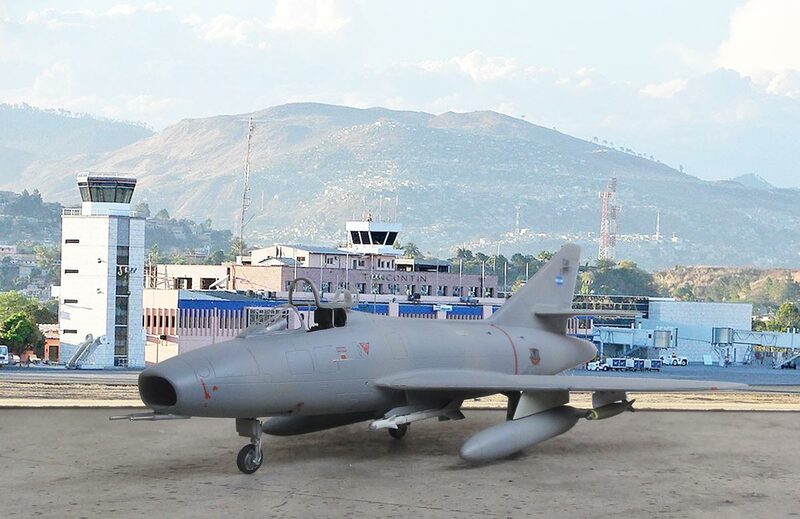 Dassault Super Mystere B.2 converted to "Sa'ar" in Israel and delivered to Honduras as the "Sambad" , coded "2011"
This airport is one of two main international airports in Honduras. 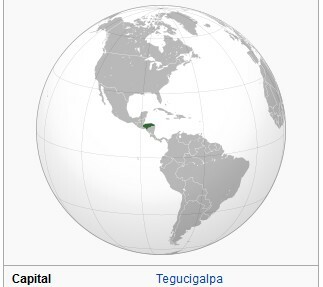 Toncontín, locally referred to as Tegus, has a horrendous approach and take-off between the mountains, as well as a short runway.